Intriguing compartmental garden in an old mill complex. The water power of the River Dawn is the key to Fairbrook’s history, first as a flour mill dating back to 1776 and, from 1846 to 1929, as a woollen mill. When Dutch artists Clary Mastenbroek and her late husband Wout Muller moved there only the house, old trees and mysterious ruins remained. 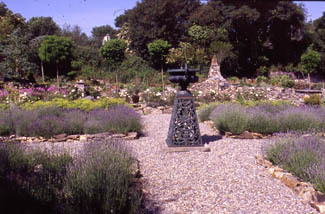 Starting in 1994, they reclaimed the garden bit by bit from brambles and piles of stones, uncovering a spring well which became the basis for a water feature, laying a path and terrace by the trout filled river, and creating compartments with hedging and reclaimed stone, and making topiary features from box cuttings. 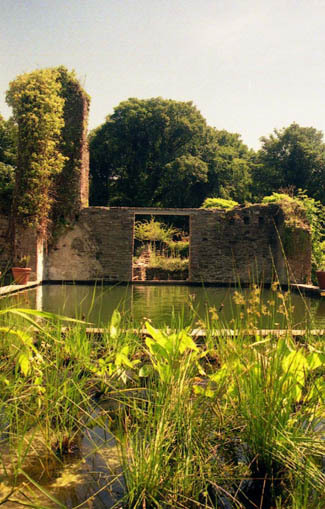 Difficulties created by the stony old industrial site were turned to advantage - the old dye vats, for instance, were lined and turned into a swimming pool, self filtered by beds of reeds, iris and water plants. 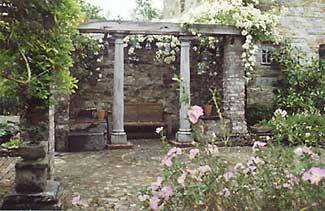 Today it is a wonderfully structured garden which is constantly evolving. Off the central vista down a gravelled path intriguing areas await discovery, a hot garden planted with monarda, Crocosmia‘Lucifer’ and the curiously named rose ‘Parkdirektor Riggers’ . Further delights are an aromatic African garden with a Moroccan door, a berceau or fruit cage walk twined with crab apples and wisteria, a lily pool guarded by agapanthus and bonsais, a parterre planted with a trio of lavenders ‘Munstead’ , ‘Hidcote’ and L angustifoliaand there is a sculpture garden, and even a maze designed by Clary. Plants and materials are used in original ways: a trinity of Prunus serrulaunder planted with bergenia stands at the centre of a beech all?e; mesh, used to reinforce concrete, is recycled as a framework for a blue climber walk for passion flower, solanum, clematis and Billardierawith its lapis lazuli berries. Box is sculpted into swirling spirals and undulating hedges, slates are made into sunbursts, and even the grass is mown into circular patterns under the trees. One of the most recent creations is a knot, its spaces filled with coloured marble and the corners punctuated by Sorbus‘Pink Pagoda’ . The garden is full of hidden corners and inviting seating areas and the latest project involves the restoration of the curious building where the raw wool was soaked in hot water. The former warehouse has been converted into a studio and museum hung with Wout, Clary’s and their daughter Tamara’s paintings, and there is also their friend Eva’s charming bric à brac shop. 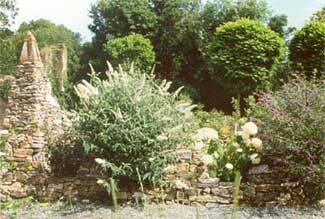 Garden has been laid out in and between ruins of the former Fairbrook Mill. Saturday 23rd of August 2008, the annual Fairbrook House Summer Concert in the Garden. Special water features, rare plants and trees. Woodland garden, historic millpond. From Waterford take the Cork road (N25) to Kilmeaden, pass the local supermarket and turn into 4th narrow road on the right.